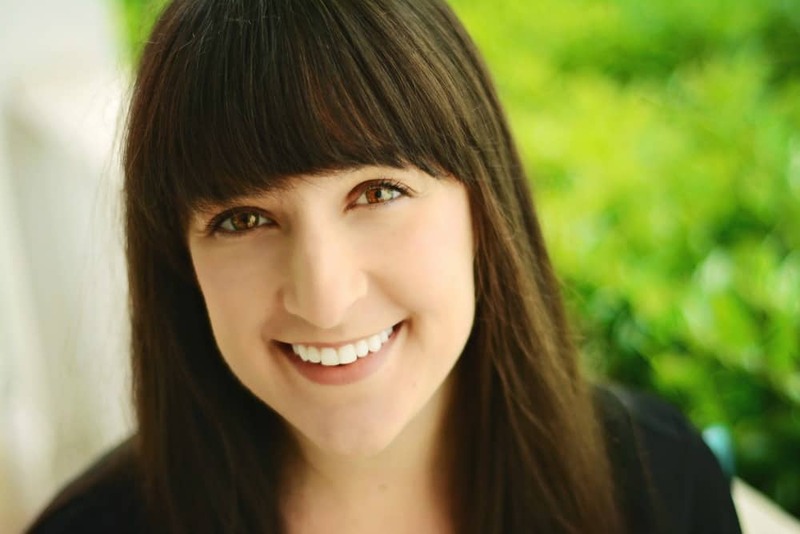 January 26, 2017 By Liz 62 Comments Note: This post may contain affiliate links. This one pan Ratatouille recipe can be made with a variety of vegetables depending on what you have in your fridge. 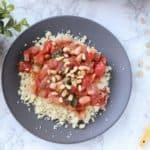 It’s vegan, gluten free, and easy to make in a skillet! I’m literally sitting here wondering why it took me so long to make ratatouille. It’s basically a bunch of my favorite flavors and it’s full of vegetables. Plus, this recipe is not an exact science and you can swap in whatever you have. A pinch of this… a little bit of that… this is my kind of recipe. 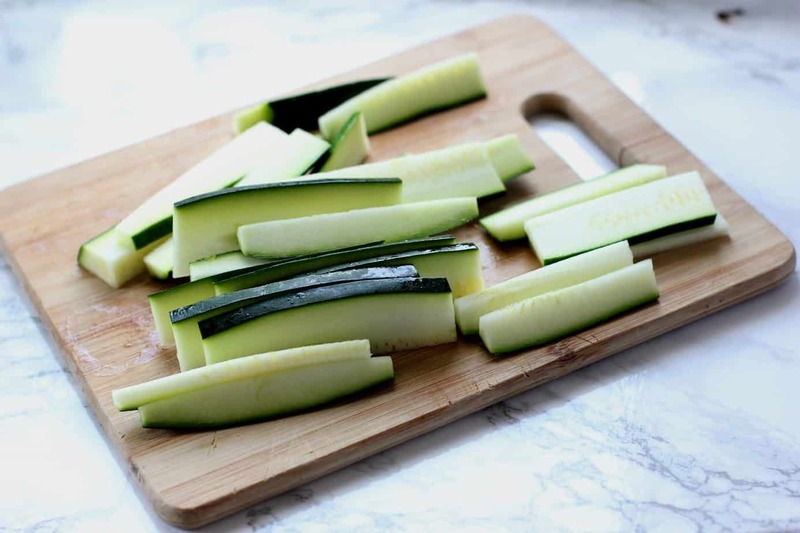 Try to cut your zucchini, squash, and eggplant into uniformly sized pieces. This will ensure that all the vegetables cook at the same rate. If you don’t have a cast iron skillet, you can make this in a regular skillet. Avoid aluminum pans, if you can. The acidic tomatoes react with the aluminum and it can create a slight metallic taste in your food. Tie your bundle of thyme together tightly so it’s easy to remove from the pan after cooking. A recipe is only as good as the ingredients and since this recipe is very simple, you want to use the best produce possible! Here are a few tips for picking out perfect ingredients. Use a high-quality brand of whole tomatoes. Muir Glen Organic has amazing whole peeled tomatoes that come in a can. I like to use whole rather than diced because diced tomatoes don’t break down as well. When it comes to picking out an eggplant, look for one that is smaller in size with firm skin that doesn’t have any large blemishes. When choosing zucchini and yellow squash, look for smaller squash which will have fewer seeds and be less watery than larger squash. Great ingredients equal great taste! You’re all set to make the perfect ratatouille! This one pan Ratatouille recipe can be made with a variety of vegetables depending on what you have in your fridge. It’s vegan, gluten free, and easy to make! Optional for serving: Fresh burrata cheese, fresh basil, crusty bread. In a large cast iron skillet or pot, heat 1 tbsp olive oil over medium heat for a couple of minutes until it begins to shine. Dice the onion and add it to the pot. Let it cook for 5 minutes. Mince the garlic and add it to the pot, cooking for another 3 minutes. Add the tomatoes and bundle of thyme. Let it cook for about 5 minutes over low to medium heat, and use a spoon to gently break apart the tomatoes. Chop the eggplant zucchini and squash into 1/2″ pieces and add them to the pot, cooking for 20 minutes, or until they’ve softened. Season with salt and red pepper. Serve with a dollop of burrata cheese, fresh basil, and a slice of crusty bread. Hello there, veggies. You’re welcome to come over anytime. Don’t they look lovely in the cast iron skillet? You can make this in any large skillet, but I love how a cast iron skillet retains heat and cooks everything evenly. We added a dollop of burrata cheese on top and ate it with some toasted Focaccia bread. Have we talked about how Burrata is amazing? If you’ve never tried it, it’s made from Mozzarella and cream so it’s basically the softest most delicious cheese ever. I’m not usually a soft cheese person… except for mozzarella. So this is my kind of cheese. Plus it just melts so perfectly on top of this warm ratatouille. Looking for something else to serve with your ratatouille? Here are a few ideas. This 5 ingredient olive oil bread is made with just a few simple ingredients (no yeast required!) so you can whip it up in just a few minutes. A spicy kale salad goes perfectly with this ratatouille and it’s perfect if you want to keep this meal light! This 5 minute whipped ricotta is a delicious appetizer and it’s great served alongside a bowl of ratatouille! And the best part of this ratatouille recipe? You can make it all in ONE PAN. That means more time eating and less time scrubbing pots and pans. The best part about this recipe? My fiance is insanely picky so I’ll get it to eat it all myself. 😉 Looks delicious! I actually still haven’t made my own Ratatouille before!! Now I don’t know why, because this looks wonderful!! I can’t even remember when was the last time I made this classic. I love it so much. Thanks for reminding about it! I love Ratatouille, and you had me at one pan! Great recipe. I love this type of recipe too where it doesn’t matter exactly what goes in. This looks both tasty and beautiful! I’d love a bowl of this right now! Ratatouille is such a colorful dish; I love how it packs so many veggies. Burrata really is amazing, and it’s perfect with your delicious ratatouille. 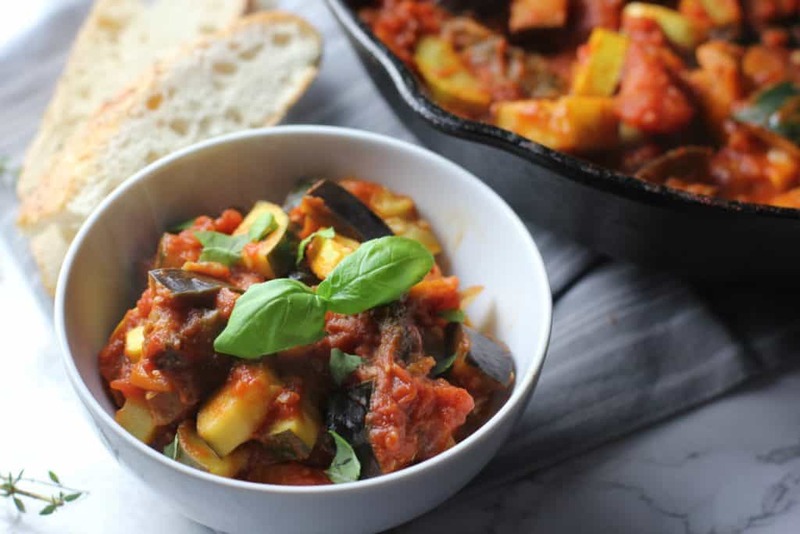 Ratatouille is one of my favourite dishes, full of gorgeous fresh vegetable goodness. Your photographs are making my mouth water! Amazing! I’m sure I can get my husband to eat his veggies this way! This looks incredible! I am a vegetarian so it’s great to find a great recipe i can actually eat! Right now, anything with one pan is my ultimate dream. This looks good. The less dishes the better, right?! I have almost everything I need to make this. I will have to try it! I love ratatouille! So doesn’t my hubby so I’ll be making this soon! I love all the fresh vegetables in this ratatouille! I’d top that baby with some burrata and go to town! This ratatouille looks so tempting. I am trying this recipe soon for sure. Thanks for sharing. Wow, this sounds amazing! I love veggie based dishes like this since you can eat a big ol’ filling portion of it. Question – is burrata cheese readily available at most supermarkets? The burrata cheese that I’ve seen is usually fresh so it’s in the deli/specialty cheese section! I can’t help but think of the movie whenever I hear ratatouille! And crusty bread is such a must for me! Looks delish Liz! I haven’t seen the movie yet but it’s on my list now! 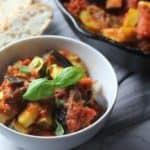 I’ve never actually had Ratatouille before but it looks amazing and I love that it’s vegan! Well now I know what to eat while I watch the Winter episode of Gilmore Girls again! Love the one pot concept too! Yum…Pinned! Yum! 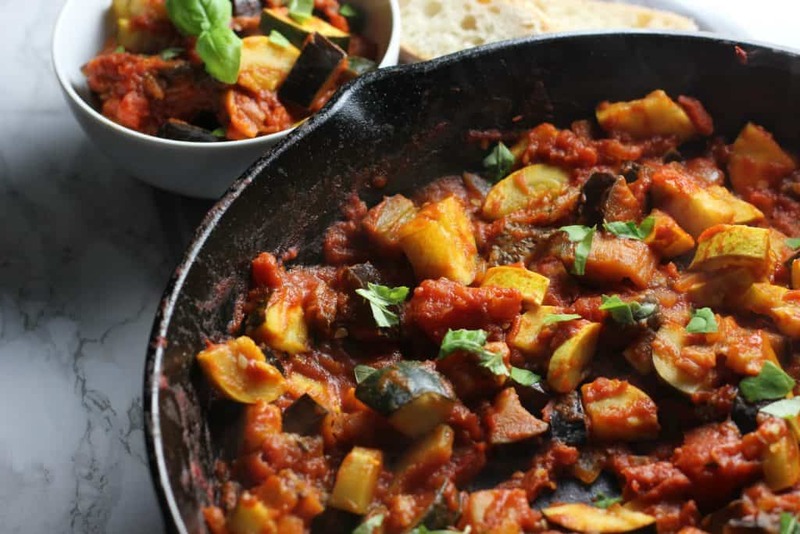 I have no idea why I’ve never made ratatouille–its literally everything I love in a pan! I want to eat it while watching Ratatouille (I love that movie!) haha! 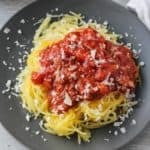 This looks delicious and I love a one dish recipe. So good mid week when you don’t want to spend too much time cleaning up. All those vegetables look magnificent. I’m glad you reminded me about ratatouille! I’ll try your recipe. Mmmh, this looks amazing. The more vegetables the better. It’s a pity all ratatouille vegetables – eggplant, zucchini – are insanely expensive right now or I’d add this to my meal plan immediately. Curry and vegan chili are two of my favourite one pot/pan meals. I’ve actually never made a ratatouille before either. This looks and sounds wonderful. What a great use for eggplant! This looks fabulous! Thanks for sharing. This recipe looks so easy and delicious. 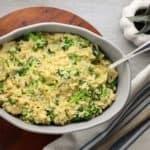 I have a similar recipe and find it’s a great way to use up veggies. wow!! ratatouille is on my bucketlist forever.. and now i need not look any further. will surely try it out.. So much to love about this ratatouille! Love all the flavors, all the veggies, and that I can make this in one pan! Looks so delicious! Haha – somehow am willing to bet your ratatouille is tastier and healthier than Suki’s! I’ve yet to try Burrata – but am on the prowl for it! Yes, this looks fabulous Liz, and gotta try that Burrata!! Yum yum yum. This looks amazing! I’m all for one-pan meals. I usually do ratatouille in the summer when my coworkers start bringing in their homegrown squash and tomatoes. I have to make this. And I’ve never tried the cheese, so I have to check it out. Great post! This looks amazing, and I particularly love that it’s a one pan dish! Great recipe! I tasted burrata once when in Madrid and it was amaaazing! I haven’t made ratatouille in years! I love the look of this recipe so I think it’s definitely going to have to happen in my house soon, especially as it’s a one pan dish! When I was growing up, we had a garden — that overflowed with zucchini, squash, eggplant and tomatoes. My mother’s solution to the bevy of veg was weekly canning — and shelves of canned ratatouille. As a kid, I hated it because we would literally have it 7 days a week. Now I love it and so does my husband… Brings back memories. Ratatouille is such a life saver, because it makes a meal of all the veggies that are bursting out of the garden right now. Love your simple variation, and the idea to add burrata to the top! Yum! I love simple and tasty recipes like this. Just give me some cheese and bread on the side, and I’ll happily tuck into this yummy dish! I love this dish and its always nice to have an easy one pan recipe too. I’ve never tried Ratatouille, but I’ve always wanted to. I guess it’s slowed me down that my hubster doesn’t care for eggplant, and the kids won’t willingly eat ANY vegetable, let alone a dish that’s all ABOUT vegetables. I may just have to treat myself to this dish: it looks AMAZING and your recipe is so simple! AND, it’s in the Gilmore Girls. Always wanted to try this dish!! Thanks for sharing!!! What a perfect comfort food! I love the one-pot thing going on too! Ratatouille is one of my favorite recipes! I love the rustic simplicity of it. Your recipe looks wonderful and the pictures are beautiful! Love the Gilmore Girls reference too! I’ve eaten ratatouille but I’ve never made it myself! Now I want to! I love that you added that dollop of burrata on top too! Love one pot meals and all those veggies sounds delicious! Ratatouille is such a wonderful classic so thanks so much for this recipe. 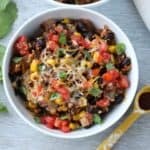 One pot recipes are my favorite – this looks amazing! I actually love Ratatouille.. but cannot remember why I haven’t made it in forever!! This looks so good.. II bet it smelled amazing too! yum. I like your description of ratatouille. Flexible recipes where you can swap vegetables in or out are the best. This looks delicious. This is looking great until I seen the brake down on the nutritional chart. WHere is the fiber value? Why is the sugar count soo high? Hey Keith! The sugar might sound high but it’s all natural sugar from the tomatoes and vegetables. There is plenty of fiber in this dish. I just didn’t have the settings to show it in the nutritional chart. Sorry about that! 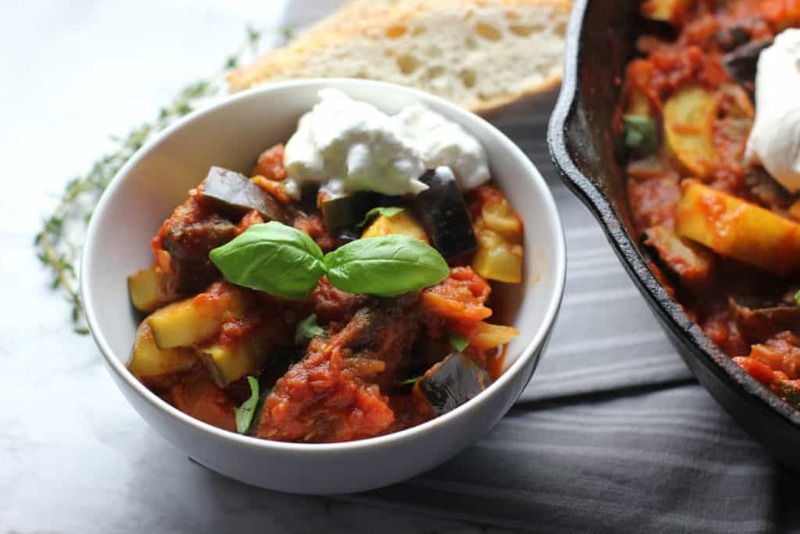 Looooove this easy peasy ratatouille recipe! It’s the perfect way to pack in the veggies with so much flavor too! Looks amazing! Question — did you peel the eggplant? Thanks! I did not! But you can if you prefer!